It was as recently as 2002 that Jennifer Wilson made her professional debut as Turandot with the Connecticut Opera but she has in the short intervening period already successfully established herself as one of the world’s leading dramatic sopranos. Following on the heels of her Connecticut success, Jennifer Wilson went on to debut with the Lyric Opera of Chicago as Helmwige/Die Walkuere and make her first European appearance in the leading soprano role in Schulhoff's Die Flammen at Amsterdam's Concertgebouw conducted by Edo de Waart. 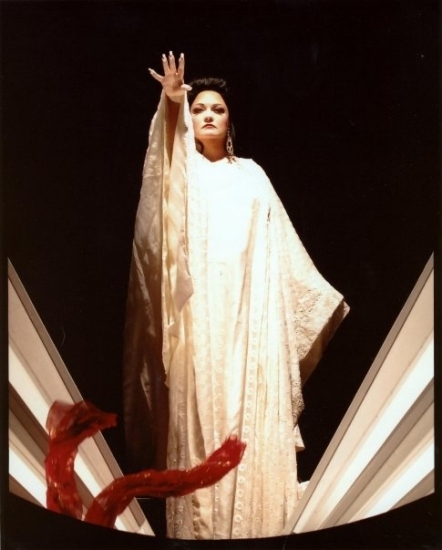 In the 2003/2004 season, Jennifer made a short-notice debut at Houston’s Grand Opera, again as Turandot, which led The Houston Chronicle to declare her "A star in the making." In the 2005/2006 season at the Paris Chatelet, she made her European operatic debut in Bob Wilson’s production of Die Walkuere, conducted by Christoph Eschenbach. In addition to further successful productions of Turandot for the Santa Fe Opera, Opera Australia and at the Thessaloniki Concert Hall in Greece, Jennifer Wilson enjoyed a huge personal success with her first Bruennhilde/Die Goetterdaemmerung at the Lyric Opera of Chicago, also performing Helmwige, Gutrune and the Third Norn in their 2005 Ring Cycles. A house and role debut as Senta at the artist’s home house – Washington National Opera – followed, and last season saw successful further house debuts at Covent Garden (Turandot with Nicola Luisotti) and at Hamburg’s State Opera (Die Walkure with Simone Young). In the 2006/2007 season, Jennifer Wilson began a multi-season collaboration with Zubin Mehta, the Palau de les Arts, Valencia and the Teatro del Maggio Musicale in Florence as she embarked on new productions of Die Walkuere, Siegfried and Die Goetterdaemmerung which culminated last season with her highly-acclaimed first complete Ring Cycle performances. “She sings with great sensitivity and tenderness. Wagner would have loved her." Also a versatile concert artist, Jennifer Wilson's extensive repertoire includes R Strauss’ Four Last Songs, Beethoven's Symphony No 9 and Verdi’s Requiem alongside less frequently performed works by composers such as Durufle', Haydn, Saint-Saens and Vaughan-Williams. Last season saw her debut with the Montreal Symphony Orchestra/Kent Nagano firstly as Elisabeth in concert performances of Wagner’s Tannhauser, returning for performances of Mahler’s Symphony No 8. A native of Fairfax, Virginia, Jennifer Wilson is the recipient of a major grant from the Olga Forrai Foundation, as well as the 2003 Robert Lauch Memorial Grant from the Wagner Society of New York and the Liederkranz Foundation's Ethel Bleakley Daniels Award for Wagnerian Voices. She is the recipient of the Evelyn Lear and Thomas Stewart Emerging Singers Career Grant from the Wagner Society of Washington, with whom she has sung a number of concerts including major scenes from Lohengrin and the final scene from Siegfried. The current season includes Jennifer’s debut as Aida for Opera Australia, a role which she will repeat at Valencia’s Palau de les Arts under Lorin Maazel, Gutrune in the Los Angeles Opera’s new Ring Cycle with James Conlon, as well as concerts in New Orleans, Montreal and Tel Aviv. Future projects include Isolde with the Leipzig Opera and at the Hong Kong Festival, as well as debuts at the opera houses in Berlin, Munich, Vienna and Tokyo.